***Please take note of the upcoming change to your Amazon Platinum Mastercard Reward Points earn rate. From the 29th of April 2019, you will earn 0.5 Amazon Reward Point for every £2 you spend everywhere else (compared with the current rate of 1 Amazon Reward Point for every £2 spent). Subject to application and status. Terms and conditions apply. The terms of your product may differ from the example. *Amazon.co.uk purchases posted to your Amazon Platinum Mastercard account between 20th and 27th November earn Amazon Reward Points at a rate of 0.0200 per penny spent. If you qualify for Instant Spend, you may start using your Amazon Platinum Mastercard to make purchases at Amazon.co.uk immediately upon approval. If you do not qualify for Instant Spend, you may not receive your card in time to benefit from this offer. Amazon.co.uk purchases posted to your Amazon Platinum Mastercard account before 20th November and after 27th November earn Amazon Reward Points at a rate of 0.0075 per penny spent; all other purchases earn Amazon Reward Points at a rate of 0.0050 per penny spent. Excludes interest, charges, balance transfers, cash withdrawals, cash related transactions and certain purchases connected to other promotional offers. 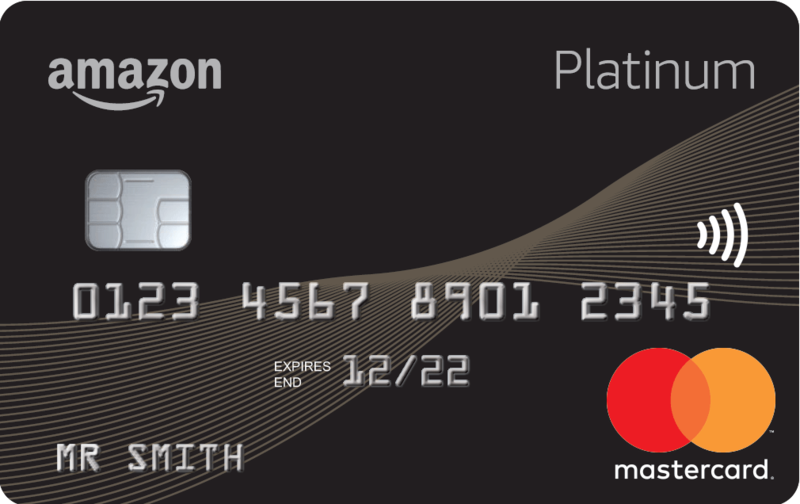 See the Amazon Platinum Mastercard Rewards Scheme Terms and Conditions for details. Please note that some purchases, e.g. pre-order items, may not be posted to your Amazon Platinum Mastercard account until after 27th November; if this occurs, such purchases will not qualify for rewards at the promotional rate of 0.0200 per penny spent. However, such purchases will qualify for rewards at the standard rate. **The Gift Card will be loaded to your linked Amazon.co.uk account on approval if you qualify for Instant Spend, otherwise it will be loaded to your linked Amazon.co.uk account when you activate your card. 1. Subject to identification checks. 2. If you do not make at least your minimum payment in full and on time or if you go over your credit limit, your promotional rate will be withdrawn and you will pay the standard purchase rate (as shown on your statement) on any balance outstanding. When the offer period ends you will pay the standard purchase rate on any remaining purchase balance. The 0% offer only applies to purchases and does not apply to any balance transfers and cash related transactions (payment for an item that is representative of actual cash) such as (but not limited to) online and in-store gambling, lottery tickets, purchase of foreign currency and money transfers. Whenever your Amazon Reward Points balance reaches 1,000 points, a £10 Amazon.co.uk Gift Card will be automatically loaded to your linked Amazon.co.uk account within two working days of your next statement. You will earn Amazon Reward Points at a rate of 0.75 per pound spent at Amazon.co.uk and 0.5 points everywhere else. You will earn points on the full transaction value (including pennies).